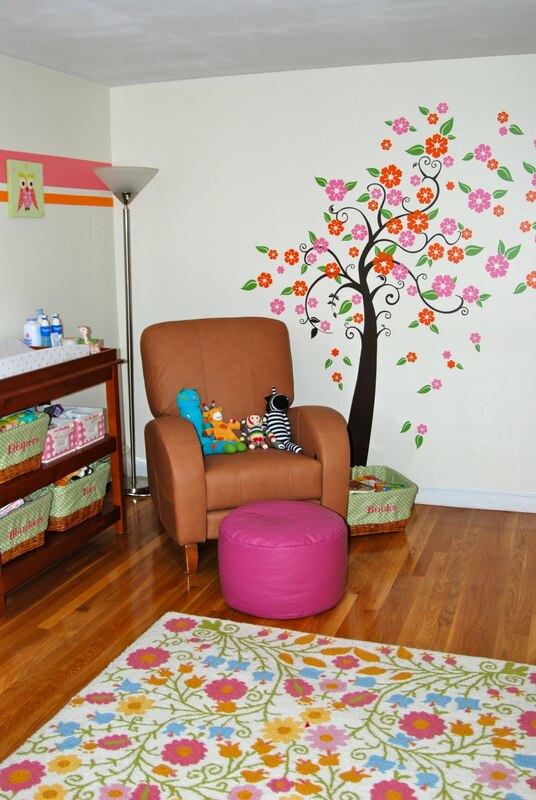 To continue with our "real nurseries" feature this is wonderfully colorful nursery which was sent to me by one of our avid readers Lan. She is having a little girl in just a few short weeks! My inspiration fo the nursery was your blog!! I was so lucky to come across it while searching for pics of "fun and modern nurseries" and I have been hooked since last October! I have literally poured over the different blog entries and found so much inspiration for the room from various nurseries that you featured. I love the links that you provide and the various tags for the categories. I cannot thank you enough for giving me so much inspiration! The first piece that I purchased was the floral rug from Land of Nod. I couldn't decide if it was really ugly or really cool...but I loved the colors in it and thought that it would be a great punch of color to the nursery. I found that so many nurseries had their first "wow" factor in the bedding, especially the crib bumper. But with so much back and forth whether or not to use a crib bumper I didn't want to risk losing my "wow" factor if I decided to take the crib bumper off after 4 months. When the rug was delivered to our house, it was love at first sight. The quality is great too. I'm so glad that I purchased it back in November (when I was only about 19 weeks along) because it is now sold out online! My favorite aspect of the room is probably the stripes on the wall. 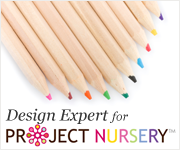 I loved all the nurseries on your blog and thought it was such a fun and different way to accent the room. Plus I wanted to use some bold colors and didn't necessarily want to have all four walls in a crazy, bold color. I think the stripes just add enough fun to the walls. Plus, I did't have to paint the whole room (it was already that base ivory color), so it was a big plus. Frog tape and a laser level are my new best friends. I love, love, love the nursery...but if I had to do it over again, I would probably choose a different color scheme - maybe a grey, yellow and turquoise and some purple. In the beginning I really wanted to stay away from the typical "pink" girl's nursery. But in the end I went ahead with pink because I just found that most of the fun, cute products for girls rooms were pink...so it was hard to stay away from that color scheme! I go a bit "bolder" with hot pink and paired it with orange to make it a little more fun and interesting. I also wanted to mix items from different stores and hot pink was always a go-to color that I knew would match with other items no matter what store it came from. For more images and information on this nursery (but I think Lan gave us most of it), please visit Lan's Project Nursery Gallery. Thank you so much for sharing your design concept and sources with us today Lan, your daughter will love her new room! SUPER cute!! I love the bedding and the painting/stripes on the wall!! What a creative nursery, great work Lan! Beautilful nursery!! Love the colors! Yes I love how she combined the colors of the Land of Nod and Serena & Lily sheet. Well done! Wow- Amazing. I love all the colors and simplicity. The stripes really make it stand-out. Great room! I recently added a wall decal to my child's room and I love the way it looks. I got mine from A AnnaBean's WallCandy collection which like Oopsy Daisy has that bright modern feel to them.